Since our inception in 1999 Eurozalm has concentrated on providing quality and service. Something you would expect from a salmon smokehouse based in the fishing village of Urk really goes without saying for us. Our smoked salmon products find their way to The Netherlands, Belgium and France. You will not find our smoked salmon in supermarkets, only at the better fish specialist which combines his own expertise with high demands in terms of taste and quality. The manual preparation of our product guarantees our customers a traditionally-produced salmon, which conforms to the ISO / HACCP standards of modern times. Next to this our company has opted to adhere 24/7 to the rules stipulated by a strict kosher regime, guaranteeing all our customers a high level of production, top quality and strict rules with regards to additives. 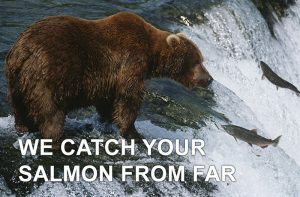 The salmon is delivered daily from the cold waters of the Norwegian Fjords and the clear waters of the Scottish coast. As you can see: Not every salmon is Eurozalm.